If you hopped onto your favorite search engine and put “tips for saving on a wedding”, there’s no doubt that you’ll find loads of links. 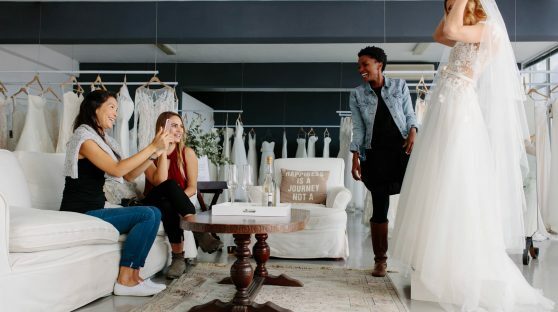 What you may have a hard time finding are specific ways to save money on you and your wedding party’s wedding day attire. But c’mon. We all know that you could easily blow your entire budget on your wedding dress alone! 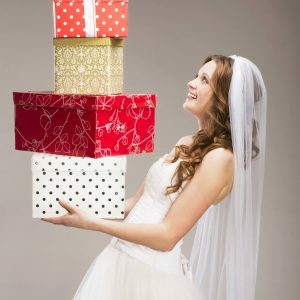 That’s why, in the effort to help you keep a few extra dollars in your bank account, we’ve come up with six proven—and a personal favorite—ways for you to save money on what you plan on wearing on your very special day. Wedding day attire is a lot like designer wear when it comes to one thing in particular—the phrasing. What we mean by this is if you go to a bridal boutique, you can automatically expect to spend more money because that kind of store specifically caters to that particular demographic. Our suggestion is to keep your options open when it comes to where you go to get things. You can find a killer pair of wedding day pumps at a department store and if you don’t want “toy soldier bridesmaids” (you know, the kind where everyone looks exactly alike), you can find different dresses, on sale, at various stores in your favorite mall or online. That first tip? It’s one that you might want to consider applying while looking for your wedding dress too. But if it’s always been your dream to have an “official” wedding dress, make sure that you at least ask for a floor sample. Think of it like getting a computer at an electronics store that isn’t in its original packaging. This tip alone could easily save you a couple of hundred bucks. 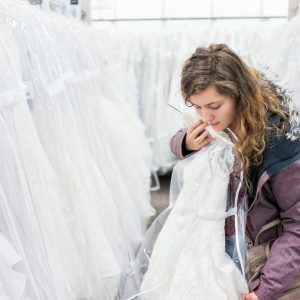 If you’ve been looking at pricey items because you want certain things about your wedding attire to look and feel customized, another thing that you might want to consider doing is shopping on a site like Etsy. From jewelry and headpieces to bridesmaid gifts and even handmade lingerie, you can find tons of merchants who will create just what you’re looking for at a mere fraction of the cost. Is it tacky to ask for gifts? Eh. It depends on the circumstances. When you’re in the process of planning your wedding, there are some instances when it’s perfectly fine. If you need some alterations done and your aunt is a seamstress or you want to your groomsmen to wear fun bowties and a close friend works at a menswear shop (and they have an employee discount), it can’t hurt to ask your family and friends if they would help you out. So that, in exchange, you’d consider it an early wedding present. Typically, it takes a good 9-12 months to plan a wedding. A part of the reason why is so you can take advantage of all of the deals that you can get from shopping during the “off-season”. June and October continue to be really popular wedding months, so try and avoid looking for wedding wear during those times. And, like with most fashion, if you want summer wedding attire, look for it during the winter season and vice versa. This last point applies to wedding attire, hair, and make-up—you name it. Say that you want a new look for your wedding day. If you go into a salon and say exactly that, we can almost guarantee you that there’s going to be an automatic markup if they even hear you whisper the word “bride”. That’s why our final tip is to avoid using the word “wedding” while doing your wedding wear shopping as much as possible. That way, you can still get what you’re looking for without spending 25-40 percent more in the process. Happy wedding day attire shopping!